The great Australian dream is to buy and own your own home. Whether you are buying an already built home, or whether you purchased a block of land and plan to build, the dream is the same. 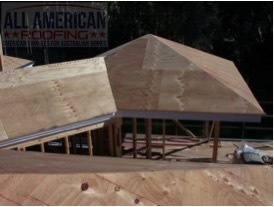 There are many options available with regard to materials and styles when you decide upon the roof. In Australia, the most common types of roofing materials are terracotta and cement tiles, or tin. In the USA, it’s asphalt shingles. The popularity of asphalt shingles is on the increase in Australia. They are appearing on many more homes and are very cost-effective and easy to install. All American Roofing is proud to announce that we are the exclusive distributor and installer of GAF Roofing products in Australia. 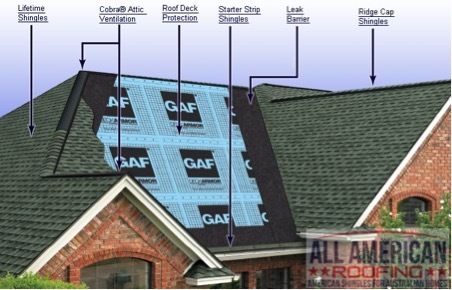 GAF is the largest manufacturer of roofing products in America and Europe; additionally, it is America’s Number one selling roof shingle with over 50 million roofs installed using GAF shingles. For the first time, Australians have a new and exciting roofing option available to them which meets or exceeds all relevant Australian building code requirements. They are cost-effective and fairly easy to install. And don’t forget they’re fire retardant properties. Asphalt shingles are somewhat easier to install than the standard cement and terracotta tiles. Cost always plays a big part in decisions that involve spending a lot of money, so the right roofing materials are worth a bit of consideration. It’s probably safe to say that you get what you pay for. Asphalt shingles, depending on the style you choose, carry warranties ranging from 25 years to 50 years. The roof shingles are affixed to the plywood. As an added benefit, the plywood increases the structural integrity of the building, raises the insulation R-value, and decreases the interior noise of the house. There is increased safety for workers and tradespeople who can walk and set up scaffolding on a fully supported roof. Customisation with solar panels or water heaters is incredibly safe and fast. 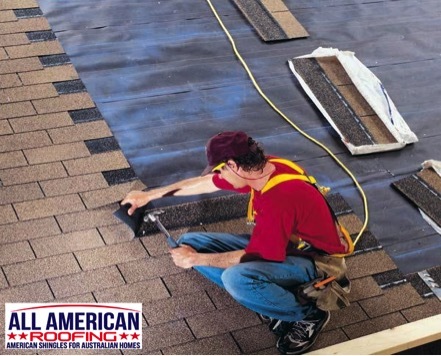 All American Roofing provides a standard of customer service to the point that they will communicate with you, your architect or home builder, and other tradesmen throughout the planning and construction process. Once the plywood is installed, the next step in the process is the installation of pre-painted, drip-edge flashing to the eaves. The Storm Guard leak barrier, a heavy-duty waterproof barrier, is attached at leak-prone areas to prevent any water entering the building envelope during extreme weather events. The next step in the roofing process is attaching the Premium breathable roof deck protection called DeckArmour, it acts as the primary waterproof membrane underneath the roof shingles. In addition to its excellent features, it is also a highly breathable membrane which helps reduce moisture in the roof ceiling space. That means stopping the build-up of toxic mould and mildew on the internal truss timbers. After completing installing the remaining roof flashings on the front and placing the sidewall step flashings the house is now waterproofed. If your house is a double storey that needs cladding on the upper walls, scaffolding can now be set up safely on top of the roof plywood and the wall cladding material can now be installed. Having heavy duty plywood installed on top of the roof trusses will dramatically increase the speed and ease of installing scaffolding allowing tradespeople to have secure footing while carrying on their work safely. At this stage of the construction, the roof is ready to receive the roof shingles. There are a couple of special shingles that need to be installed at the eaves and rakes of the roof. These particular shingles help protect against water infiltration and wind current at critical areas. The roof is now ready to be finished off with the asphalt shingles. By this time, the colour and design has been decided on by the homeowner. The strength of the installation, using six nails per shingle, will guarantee it holding through a category 4 tropical cyclone with winds at about 200 km/h. Another important consideration is roof maintenance. It’s easier walking on an asphalt shingle roof than on clay or cement tiles as they can break or crack. If you are up on the roof for any reason, cleaning a flue, a chimney, or clearing the gutters, your ease of access on the asphalt shingles is far better. In the end, when you are making that decision about what is the best material for your roof, you should take many factors into consideration. Cost, longevity, resale value, curb appeal, warranty, and repairs can be factored into your decision. If by chance you stay in the same house long enough, you should think about replacement cost as well.